Phone carriers and banks have gained confidence in using mobile data for lending after seeing startups show preliminary success with the method in the past few years. Financial institutions, overcoming some initial trepidation about privacy, are increasingly gauging consumers’ creditworthiness by using phone-company data on mobile calling patterns and locations. 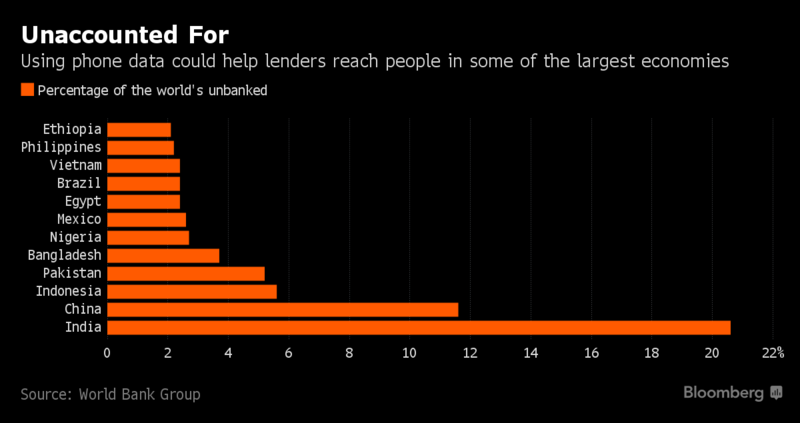 The practice is tantalizing for lenders because it could help them reach some of the 2 billion people who don’t have bank accounts. On the other hand, some of the phone data could open up the risk of being used to discriminate against potential borrowers. Phone carriers and banks have gained confidence in using mobile data for lending after seeing startups show preliminary success with the method in the past few years. 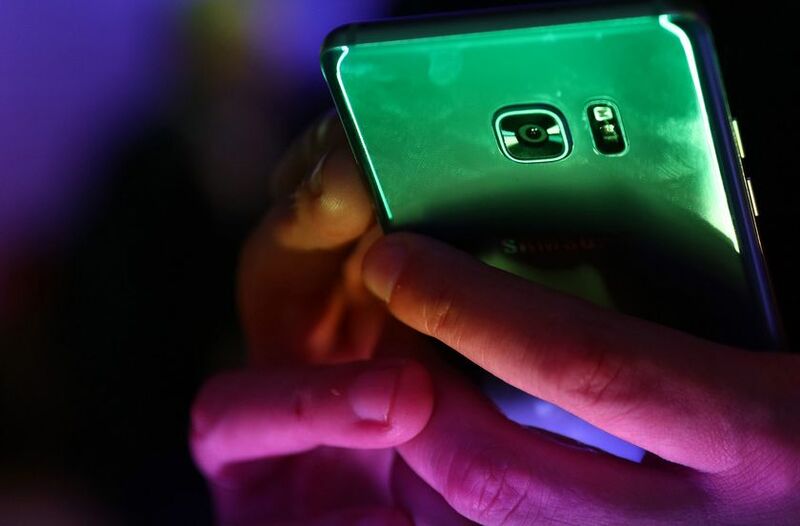 Selling such data could become a more than $1 billion-a-year business for U.S. phone companies over the next decade, according to Crone Consulting LLC. Fair Isaac Corp., whose FICO scores are the world’s most-used credit ratings, partnered up last month with startups Lenddo and EFL Global Ltd. to use mobile-phone information to help facilitate loans for small businesses and individuals in India and Russia. Last week, startup Juvo announced it’s working with Liberty Global Plc’s Cable & Wireless Communications to help with credit scoring using cellphone data in 15 Caribbean markets. And Equifax Inc., the credit-score company, has started using utility and telecommunications data in Latin America over the past two years. The number of calls and text messages a potential borrower in Latin America receives can help predict a consumer’s credit risk, said Robin Moriarty, chief marketing officer at Equifax Latin America. The new credit-assessment methods could allow more people in areas without bank branches to open accounts online. They could also make credit cards and loans more accessible and prevalent in some parts of the world. In the past, lenders mainly relied on bank information, such as savings and past loan repayments, to judge whether to let someone borrow. Some of the data financial institutions are using come directly from interactions with potential borrowers, while other information is collected in the background. FICO’s partner EFL sends psychological questionnaires of about 60 questions to potential borrowers’ mobile phones. With Lenddo’s technology, FICO can check if users’ phones were physically present at their stated home or work address, and if they are in touch with other good borrowers — or with people with long histories of fooling lenders. “We see this as a good opportunity to explore that type of data for risk assessment, as a viable means of extending financial inclusion,” David Shellenberger, a senior director at FICO, said in an interview. Juvo’s Flow Lend mobile app uses data science and games — like letting users earn points — to build real-time subscriber profiles, to let C&W personalize lending criteria and provide immediate credit extensions. Prepaid customers can request credit advances for airtime and data. Denise Williams, a spokeswoman for C&W, didn’t immediately return a request for comment. In most cases, consumers must grant permission for their telecommunications records to be accessed as part of their risk assessment. One reason it’s taken the credit-risk industry some time to work out agreements with phone carriers or their representatives is because of negotiations over how to best protect client privacy. Companies are also concerned about making sure they don’t make themselves susceptible to claims of bias. By checking phone records to see if a credit applicant associates with people with a poor track record of repaying loans, for example, lenders risk practicing discrimination on people living in disadvantaged neighborhoods. In addition, to comply with the Fair Credit Reporting Act in the U.S., a data provider must have a process in place for investigating and resolving consumer disputes in a timely manner — something that telecommunications carriers abroad may not offer. Several large phone companies contacted by Bloomberg declined to comment about whether they share data with financial institutions, and few of the startups or financial companies were willing to disclose their telecommunications partners. Startup Cignifi, which helps customers like Equifax crunch data on who phone users are calling and how often, works with phone companies like Bharti Airtel Ltd.’s unit in Ghana. Cignifi scores some 100 million consumers in 10 countries each month, said Chief Executive Officer Jonathan Hakim. Banks typically use such assessments alongside other evaluations to decide whether to grant a loan. Airtel didn’t respond to requests for comment. “The way you use the phone is a proxy for the way you live,” Hakim said. “We are capturing a mirror of the customer’s life.” His company collects phone data — such as whom the potential borrower is calling and how frequently — from partners like Airtel Ghana, and crunches it for customers like Equifax, as well as marketers. It scores some 100 million consumers in 10 countries each month, Hakim said. Banks typically use such assessments alongside other evaluations to decide whether to grant a loan. Cignifi always gets customers’ permission to use data, he said. EFL’s questionnaire approach is already used by lenders in Spain, Latin America and Africa. More than 700,000 people have received more than $1 billion in loans thanks in part to its data, CEO Jared Miller said in an interview. EFL’s default rate varies by country, from low single digits in India to low double digits in Brazil, Miller said. To account for the risk, lenders in Brazil charge much higher interest rates, he said. Startups like Lenddo, Branch and Tala have collected several years’ worth of data to prove that their methods of using mobile-phone data work — and that customers flock to them for help. Started in 2011, Lenddo, for instance, spent 3 1/2 years giving out tens of thousands of loans, in the amount of $100 to $2,000, in the Philippines, Colombia and Mexico to prove out its algorithms. Its average default rate was in the single digits, CEO Richard Eldridge said in an interview. The company stopped offering lending in 2014, and stepped into credit-related services to financial institutions and banks in early 2015. Embedded into banking mobile apps, it can collect data on users with their consent. The company’s revenue is up 150 percent from last year, Eldridge said. This entry was posted in Banking and tagged big data, Lending, phone data on November 27, 2016 by Bone Fish. Traditionally a major focus at bank-owned brokerage firms, securities-backed loans — where a wealthy investor puts up their portfolio as collateral for a big-money purchase &mash; are increasingly being marketed through independent registered investment advisers. In the past two years, use of the products has soared as custodians beef up their lending capabilities. Pershing Advisor Solutions, a subsidiary of The Bank of New York Mellon Corp., began offering the loans to RIAs last year and has already issued 254 of them worth $1 billion through more than 20% of its 570 RIA clients. Fidelity Investments, which serves about 3,000 RIAs, has seen balances for securities-backed loans increase 63% in its RIA segment over the past two years. “Non purpose loans have gotten more attention over the last year-plus with the custodians,” said John Sullivan, a former lending specialist at Smith Barney who is now a relationship manager at Dynasty Financial Partners. “Every effort is being made by firms like Dynasty and the various custodians that are out there to be able to replicate or in some cases exceed the existing platform” at the wirehouses. For years, the loans have been a popular product at the wirehouses, including Bank of America Merrill Lynch and Morgan Stanley Wealth Management. They are billed as a way for wealthy investors to make large purchases, such as a yacht or vacation home, without having to sell a portion of their portfolio or incur capital gains taxes in the short term. Bank of America Merrill Lynch had $11.7 billion in margin loans outstanding, according to its most recent SEC filings from March. There is no upfront cost to set up a securities-based line of credit, and firms offer competitive rates, which are sometimes lower than a traditional bank loan and are particularly attractive now with low interest rates. The loans can be made in a relatively shorter period of time than traditional bank loans as well. They take as few as eight business days at Pershing. But there are other reasons firms, including the wirehouses like securities-backed lending. The loans provide another income source from clients in fee-based accounts and can be more profitable for the firm than other investment products because they don’t have to share as much of the revenue with their advisers who sells the clients on the loan. “Lending growth will enhance the stability of revenue and earnings for the firm as a whole and make our client relationships deeper and stickier,” Morgan Stanley & Co.‘s former chief financial officer, Ruth Porat, said in an earnings call in July. RIAs specifically don’t receive any additional compensation from a bank or custodian for selling securities-backed loans, but there are other benefits. For example, the loans allow wealthy clients to make multimillion dollar purchases without cutting into the assets under management. Bob LaRue, a managing director at BNY Mellon, said new business from clients often results as well — and, of course, the dollars left in the portfolio have the potential for gains, which raise AUM. Herein lies the rub, according to Tim Welsh, president and consultant of Nexus Strategy, a wealth management consulting firm. “They don’t sell, so the assets under management stay the same — so it inherently has a conflict of interest,” he said. That can be a problem, Mr. Welsh said, particularly because client demand typically is highest for these kinds of loans at the wrong time. The risk is that if the value of a client’s portfolio drops, the firm can sell the securities or ask that the client put down more money to back that up. Using securities as collateral can be subject to greater volatility than other types, such as a home equity loan. Regulators have taken notice as well. The Financial Industry Regulatory Authority Inc., which oversees broker-dealers, warned in January that it was looking into the marketing of securities-backed loans as part of this year’s regulatory agenda. “Finra has observed that the number of firms offering [securities-backed loans] is increasing, and is concerned about how they are marketed,” the regulator said. That said, Mr. Sullivan and others who defend securities-backed lending said it works well if that risk is taken into account. “It’s really about staying invested for the long-term and meeting short-term cash flow needs with some borrowing that’s not going to exceed a certain percentage on the assets,” Mr. Sullivan said. Mr. LaRue said advisers have to consider whether it makes sense to trade leverage for the tax benefits. This entry was posted in Banking, Billionaire, Stocks, Uncategorized and tagged Lending, securities loans, subprime lending, wirehouse on June 11, 2015 by Bone Fish.